2018 Runner Up for Best Multihull under 57ft in the Annual BVI Charter Yacht Show. 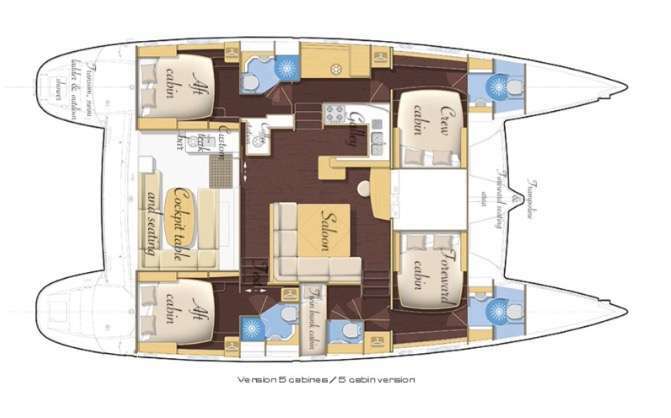 Gambit offers 4 en-suite cabins for guests. The yacht offers a full range of diving gear for diving in the Virgin Islands. The catamaran is based in the Virgin Islands over the winter and available in the Caribbean Grenadines over the summer. Step aboard Gambit and experience the Caribbean with her experienced, friendly crew. To ease you into life at a slower pace are Doug and Val Fairfield, an English speaking, husband and wife team from South Africa, with many years combined cruising, travel and charter experience. Doug has been an avid adventure sport enthusiast throughout his life. He is an advanced skydiver with 2500 jumps, and was the chief instructor at the local skydive club prior to his involvement with sailing; he is an experienced paraglider, loves scuba and free diving, as well as water and snow skiing and has completed a number of arduous long distance marathons. He is a natural storyteller and entertainer with a great sense of humor, a charismatic and attentive host, willing to go the extra mile to ensure you get the most out of your vacation. Val grew up on a vast dairy farm in the Drakensberg farming district of South Africa, and attended boarding school, before qualifying as a private secretary and then a primary school teacher. She traded horse riding and hiking for sailing, and was perfectly positioned to home school the children while cruising. She is a qualified scuba diver, and enjoys snorkeling, skiing and hiking, and living the island life. She takes pride and pleasure in creating inviting spaces through tasteful choice and use of fabrics and decor, and is an accomplished seamstress. This is evident in the decor aboard Gambit, redecorated since arriving in the BVI a few months ago. Many years of challenging galley responsibilities have enabled her to become a competent and creative chef aboard, fine tuned by various short courses in culinary arts. Doug and Val have a passion for traveling and a special affinity for the African bush, it’s wildlife, beauty, solitude and wide open spaces, and have been fortunate to do an extended three month 4x4 camping safari with roof top tent through some of the most unspoiled and rugged areas of Southern Africa. The freedom of traveling without boundaries inspired a six week camper van tour of New Zealand last year, wild camping without the constraints of official campsites in the winter wonderland of mountains and fjords. During this time we took the opportunity to try our hand at dog sledding, abseiling and caving. We have spent a month touring Sri Lanka traveling by train and staying in local B&B’s, visited Egypt and driven off the beaten track through the Western Desert, camping in the splendor of the White Desert en route. We have driven across the USA and would love to follow this up with a longer RV trip in the not to distant future. After many years sailing together, (mostly with children aboard), and in excess of 70 completed charters, we team up on deck to offer you a fun filled sailing vacation, and when the anchor is down, a companionable, relaxed yet attentive atmosphere is created for you to escape your normal routine and create memories which will live with you forever. We would love the opportunity to extend a warm welcome to you in the BVI, offer you our hospitality aboard Gambit, and show you around some of our lovely anchorages and must see spots that we’ve come to call home. Contact us for rates and current availability or to book a charter aboard Gambit! Scuba Info Guests rent or bring their own wet suits, specialized gear and dive computers. Diving only offered in the Virgins. Scuba Terms 3 dives per week included for certified divers, includes equipment. Meal times are always a significant aspect of any vacation! On Gambit we aim to provide our guests with attractive meals which are both appetizing and nutritious, whilst accommodating your dietary requirements, likes and dislikes as best we can. We focus on preparing meals using a combination of locally obtained produce such as fresh fish, chicken, meat, tropical fruit and vegetables, rather than importing exotic ingredients and out of season foodstuffs. We serve breakfast, a light lunch and dinner in the cockpit or at the saloon table, with chilled water, fruit juice, tea or coffee to accompany it. In addition we have our ‘Captains Bar’, providing you with that perfect glass of chilled wine, a cold beer or soda, a selection of standard spirits and mixers, or a sundowner cocktail. Usually a casual, relaxed meal served family style at the cockpit table during a break inactivities and sailing. Pork tenderloin medallions flambéed and served with a Mount Gay Jamaican Rum sauce and colorful roasted veggies. Barbecued tuna steaks marinated and served with a sesame ginger lime sauce, and couscous tossed veggies.